Posted April 3, 2014 by Eric Graham . In the age of big data, sharing content is a running battle, especially for a small business. One way to stay ahead of the curve is to build your brand’s image by using an informative picture, otherwise known as an infographic. Few other mediums give you the chance to entice your potential customers with a helpful cheat sheet that relates to your business, knock them dead with something funny, or inspire them with a touching story. One image to sum up your point. Sounds cool, right? But how does this revolutionary tool better your marketing strategy? Two million blogs are written every day, which is enough to fill Time Magazine for 770 years, says digitalbuzzblog.com. How are you going to drive people to you? Infographics are a perfect way to engage your audience and capitalize on limited attention spans. Buddy Media reports that people choose to stay or leave a site in the first 2-4 seconds of looking at the page. Due to the visual aspect of infographics, they require a different level of engagement that naturally captures and keeps the viewers attention. Mesmerize your customers with the combination of colors, images, movement and content that naturally draws the eye. Buddy Media also reveales that images, infographics and other visual content shared on Twitter generate two times more engagement than those without images. In other words, social networks are rapidly becoming image based versus text, and infographics can help you separate yourself from your competition. Infographics also help increase blog page rankings and social media engagement, leading to more site visitors and more potential customers. Social media is constantly changing, and right now it’s rushing into its most visual stage. Forbes Magazine points out that a “visual information — when presented clearly — trumped textual information by tenfold… [and] a good infographic can spread quickly on the Internet, giving other bloggers and writers something to talk about, and the creator backlinks and exposure”. 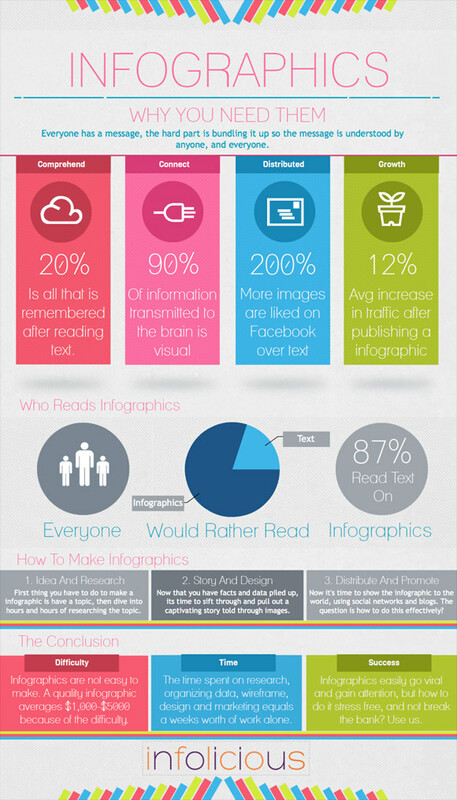 Infographics are a great tool to build more brand awareness for your business. The key to success is to share information about something you know both you and your customers care about. With all the content and blogging, reader’s attention spans are dwindling, so make sure your infographic is something they will remember! Demonstrate your expertise and become a leader in your industry by sharing useful and valuable content that people will understand. Sharing wisdom creates a unique connection, allowing you to develop relationships with your audience and community. If you want to get the ball rolling and use infographics to further your content strategy — but still feel like a fish out of water — we can help. Our team of analysts and graphic designers can turn your data into a striking presentation and make you into a compelling storyteller. If you are interested in learning more about our services, give us a call today at 303-703-8000, or just fill out our contact form! Read on for a quick case study…an infographic ABOUT infographics!